My third design in my Limited Edition Series, I wanted to create a pretty feminine design in warm shades of pink and gold as an expression of ‘love & warmth’. Continuing on from the generic Asia theme of my Chinoiserie in Neutrals and Chinoiserie in Aquamarines & Powder Blues I have again included imagery from various Asian cultures. I found a lovely dusty old framed image of Lakshmi, the Hindu Goddess of Wealth, Fortune and Prosperity, faded in the sun from many years of being hung on a temple wall. Also included is a photo of the beloved ‘Kuan Yin’ the Chinese Mother Goddess of Mercy and Compassion sitting on her Lotus Flower - this photo came from Hong Kong where I used to live. 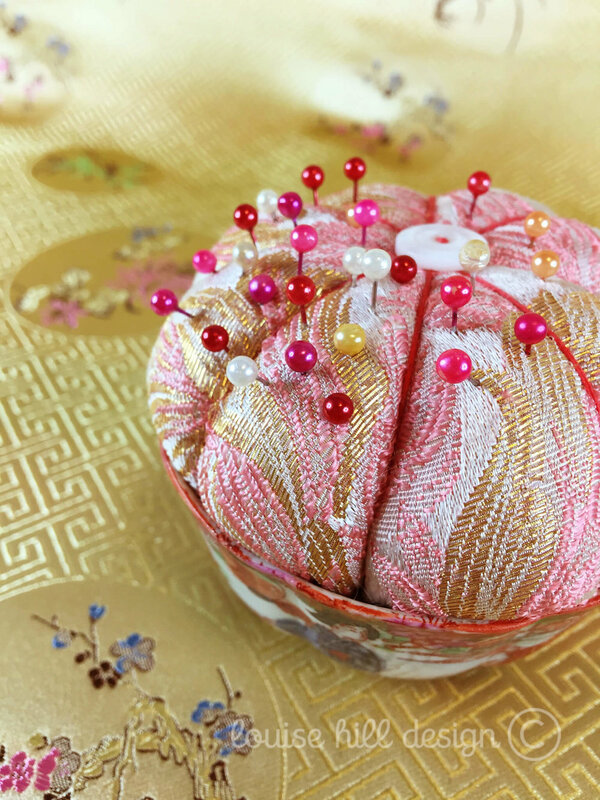 I spend many months collecting various vintage objects and fabrics for my prints and I picked up some beautiful gold and pink silks in Taipei Market recently which feature here alongside various still life photos, embroideries and illustrations. 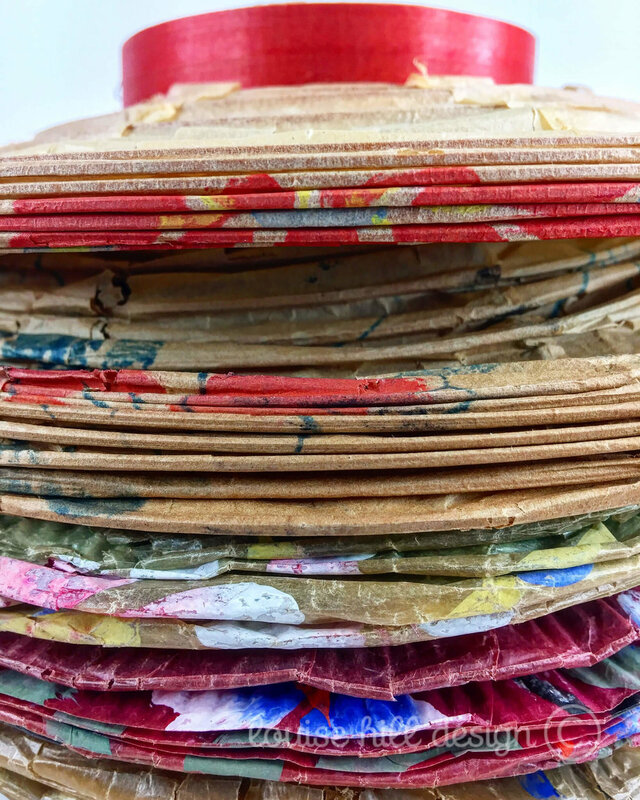 I especially love the image of the stacked, folded, hand painted Chinese lanterns which came from a vintage shop in America and are so old and delicate that you can barely open them. I bought them online and had them shipped to Singapore - I'm amazed that they survived the journey! I like to weave my imagery into intricate layers, creating a kind of luxurious pattern based on traditional Chinese Lattice wooden designs commonly used as window frames. The lattice frame for this design has an intricate gold brocade silk as it’s background pattern. 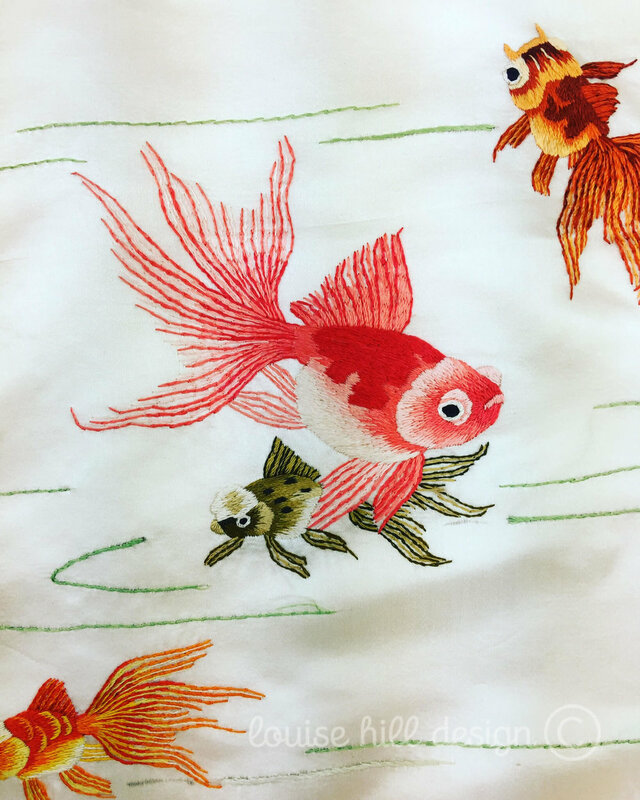 A piece of material I picked up in a Shanghai market many years ago. The central ’Double Happiness’ symbol adds more powerful symbolism - not only is it used as a popular icon for weddings but is also a favourite of mine as a Mother of twin boys. The stunning Thai painting on wooden panels to the left, was photographed on the resort Island of Koh Samui where I was married. Overall, I love the warm and comforting golden glow that this design eminates - my interpretation of a ‘celebration of femininity and good fortune’. Printed onto 310gsm Hahnemuhle German Etching Paper, these hand-finished prints are signed, numbered and stamped with a golden Louise Hill Design logo on the front. Each print includes a Certificate of Authenticity sealed with my gold foil logo, embossed stamp, signature and edition number. Please note that signing, stamping and framing takes up to 14 days to complete from the date your order is scheduled for hand-finishing in my order book. For the framed prints we use a ‘Champagne’ coloured 2 cm wooden frame chosen especially to match the artwork’s delicate colours. SIZE UNFRAMED: 18 H X 43 W " inches | 45.72 H x 109.22 W cm (image area) with a 3" or 7.62 cm white border. SIZE FRAMED: 23 H x 48 W " inches | 58.5cm H x 122 W cm - including a white mat board and 2cm frame. AS THIS IS A LARGE PIECE, IT COMES WITH TWO HOOKS IN PLACE ON THE BACK OF THE FRAMED PRINT AND SHOULD BE HUNG ON TWO SCREWS IN THE WALL, ON THE LEFT AND RIGHT CORNERS. PLEASE ASK A HANDYMAN OR A LOCAL FRAMER TO HANG THE PIECE FOR YOU.